The video game console manufacturing is a really fascinating sector of the consumer electronics industry. From the standpoint of economics it’s this little microcosm of monopolistic competition and were the moves of each competitor can impact all the others or even the whole industry. This in laymen’s terms means the competition is tight, the products are similar, and on the move to differentiate products, manufacturers make some “interesting” choices. If we where to walk along the road of home video gaming console history we would find the bodies of countless victims who strove for the brass ring and failed. Some of them were because they hit the market past their prime, and ye others because they where way ahead of their time. There is one group however that seems to be a little bit of both and they are the ones that seem to have to corpses of notoriety, infamy, and ridicule you learn about along the way. These are of course are the mezzanine consoles, or of generation x.5 systems that left behind the safety of the current gen to bring us the next big thing but just couldn’t deliver. Sometimes this was because the system was just crap, or because it was quickly replaced. Others times marketing departments were to blame, or a company just out and out screwed up by making a rash decision in the fight for market share and product differentiation, in a world of monopolistic competition. There are probably many of these Generation X.5 mezzanine systems out there but I’m going to focus on four in this series. 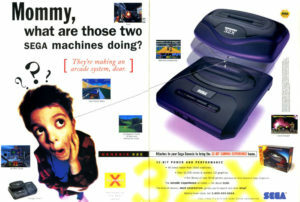 I will be taking a look at Generation 2.5’s Atari 5200, and Gen 3.5’s Sega CD, Sega 32X, and Atari Jaguar. I don't know the stories about those "gen3.5" consoles you list. But, in a nutshell, IIRC, the Atari 5200, while a perfectly laudable system (great game-selection, great GFX & sound, etc. ), it came into a time when the entire gaming-console market was in its dying throes. While its predecessor, the extremely market-booming Atari 2600 VCS, that virtually everyone and their mother had bought since 1977, 1982's Atari 5200 was an excellent advancement and should have been a successful successor. But home computers had made their entrance into the industry and would completely supplant the home-gaming market. Thus, it wasn't long thereafter that the infamous Video-Game Crash of 1983* occurred, effectively ending consumer demand for gaming-consoles. Interested consumers wanted computers instead by which they could still play games at home, but much better and in new ways not previously possible with any console AND also perform a virtually endless variety of computerized tasks–they could game better AND compute for themselves just as comfortably at home as before. In short: Gaming-consoles were out; home computers were in, so the consumer market for consoles went dead. Such would be the case for some years henceforth until Nintendo released its Nintendo Entertainment System (the NES) which resuscitated the gaming-console market to life again later. *Mind you regarding the Video-Game Crash of 1983: The '83 Crash affected solely the gaming-console market. 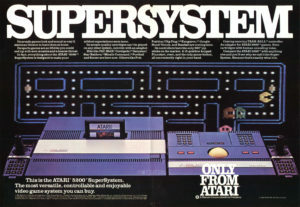 The '83 industry-crash did not affect the home computer-game industry, which contrarily was on the rise, replacing said consoles in the marketplace and thus in the home of its consumers, nor did it affect the Arcade Coin-Op industry either, as the Arcades were still as wildly popular as ever.